Translating CLI: Please help translating CapsLock Indicator into your language! Visit the translation page to learn more! CapsLock Indicator is a small, free utility that indicates the state of the Num lock, Caps lock and Scroll lock key. CapsLock Indicator's intuitive user interface makes it really easy to find your way around the software. It was designed with user experience and usability in mind. 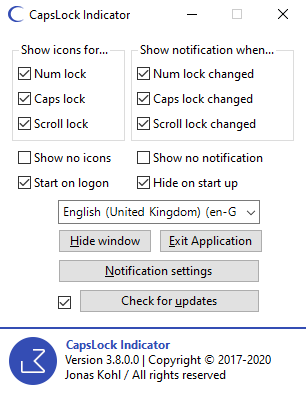 CapsLock Indicator is capable of displaying the status of the Num lock, caps lock and scroll lock key as tray icons in the taskbar. Addionally it can also show a small overlay indicator whenever the state of one of these keys is changed. The overlay can be turned on or off for each of the three keys individually and the colours and display time of the indicator can also be customised. CapsLock Indicator is a stand alone executable and doesn't require installation. Thus it is very easy to set up and deploy. CapsLock Indicator is open source freeware. You can use it whereever you like, without any cost whatsoever. Currently it only supports Microsoft Windows (See system requirements). If you want to translate CapsLock Indicator into another language, you can get more information here. If you have any questions, feature requests or bug reports, please open a new issue on GitHub.